“Roguelike” is a term thrown around a lot these days. In fact if you look up the roguelike tag on Steam you’ll find a plethora of indie titles available, however most do not truly live up to the term as, in today’s lazy lexicon, “roguelike” just means procedurally generated content and something resembling permadeath. Yet Stephane Valverde, the creator of Paper Dungeons, hopes to bring you a true roguelike in it’s sequel, Paper Dungeons Crawler to PC, Linux, and Mac, and he’s looking it to generate funds through Kickstarter. 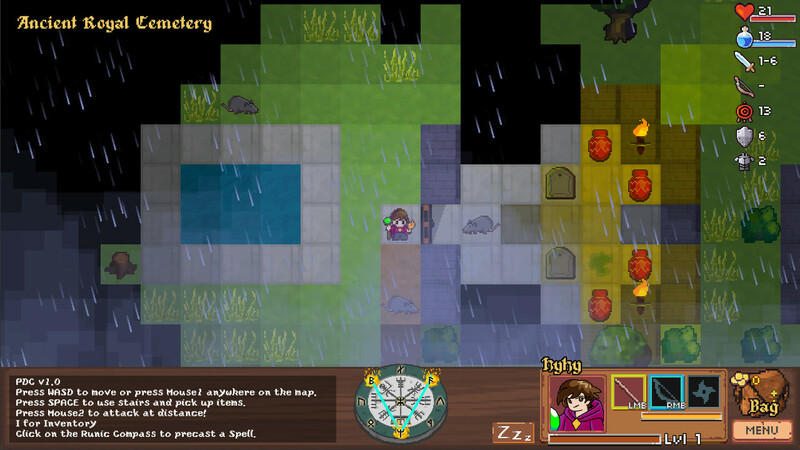 You can expect to find all the classic traits of roguelikes in Paper Dungeons Crawler. Step-based and turn-based movement and combat, permadeath, and of course randomly generated dungeons and content are to be expected, but in addition to these features Paper Dungeons Crawler will also include a unique magic system revolving around the use of runes. Spells are executed by drawing lines to connect these runes, as you can see below. The game will feature five different character classes: Warrior, archer, priest, mage, and thief. These classes will have access to four unique runes for casting as well as different talents and skills. If you would like to take the game for a spin you can download the demo here. A pledge of $6 (Early bird)/$11 gets you the game! The early bird reward tier is still available as of writing this article. A pledge of $24 gets you the game as well as your name in the credits. A pledge of $61 will get you the game as well as your name engraved on an in game tombstone. Paper Dungeons Crawler is looking to raise $2,429 and as of writing this article is sitting at just $144 with 17 days remaining. If you think this looks like something you might be interested in maybe give some extra consideration to backing it. Check out the Kickstarter here.